Suppressing effect on the inflammation that promotes metabolic syndrome. Palmitoleic acid (C16 :1 n-7), commonly known as omega-7, is a rare monounsatured fatty acid, which was generally reported to benefit the skin in promoting epithelialisation, and certain gynaecological problems (vaginal mycoses). Until now, sea buckthorn (Hippophae rhamnoides), a shrub widely found in Europe and Asia, and macadamia nuts have been the principal sources. However, recent advances have enabled it to be isolated from anchovies - a new, exceptionally rich source with a concentration of 50% compared with that of 13%-20% in plant-source equivalents. The discovery was made while scientists were focusing on the overall effects of fatty acids, including the famous long-chain omega-3s, EPA and DHA, on improving cardiovascular function. Researchers at Harvard Medical School, the Cleveland Clinic and universities in Hawaii and Japan found that omega-7 had significant effects on the so-called ‘diseases of civilisation’, as a result of which they developed a method for isolating and purifying this precious fatty acid. 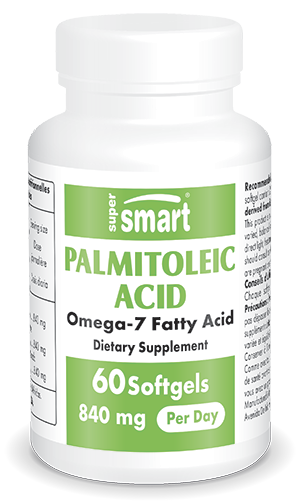 Palmitoleic Acid contains Provinal®, a fish extract (from sustainably-fished wild anchovies) standardised to 50% palmitoleic acid. It is currently the only ultra-purified, non-GMO, highly-concentrated source of omega-7, with levels of antagonist fatty acids such as palmitic acid of less than 1%. It is guaranteed free from PCB residues, dioxins and heavy metals. • It acts as a ‘lipokine’, ie, a hormone that can modulate lipid metabolism by stimulating certain adipocyte nuclear receptors. It also serves as a metabolic biomarker, as low serum concentrations indicate a risk of metabolic disease and the need for lipogenesis stimulation. Provinal® is currently one of the few nutrients that protects against atherosclerosis, by raising HDL-cholesterol and acting on inflammation markers. In this context, Palmitoleic Acid can be taken on its own or in combination with other nutraceuticals that promote good cardiovascular health - vitamin K2 necessary for blood coagulation, and EPA and DHA which help maintain blood lipid balance. Each capsule of Palmitoleic Acid provides 210mg of palmitoleic acid. Taken for a minimum of 1 to 2 months, at a dose of 1 to 2 softgels a day with your main meals, this side effect-free supplement acts both curatively and preventively on various diseases and conditions: type 2 diabetes, metabolic syndrome, insulin resistance and atherosclerosis.